Robert Lucero was arrested and charged with Burglary, Aggravated Fleeing and Breaking and Entering. Megan Wharton was arrested and charged with Conspiracy and Breaking and Entering. Robert Lucero,24, was arrested and charged with Burglary, Aggravated Fleeing and Breaking and Entering. Megan Wharton, 29, was arrested and charged with Conspiracy and Breaking and Entering. On July 13th, 2017 the Albuquerque Police Department Auto Theft Unit was conducting a bait operation in the downtown area in an effort to reduce crime in this area. The Auto Theft Unit had a bait vehicle in the area of 2nd St and Lead Ave due to an increase of auto burglaries. At about 7 a.m., a male who was later identified as Robert Lucero was observed entering the city owned vehicle. It appeared as if he was trying to steal the vehicle however he was unable to start it. Instead Lucero removed items from inside the vehicle and left the area in a silver 4-door Hyundai driving away at a high rate of speed. 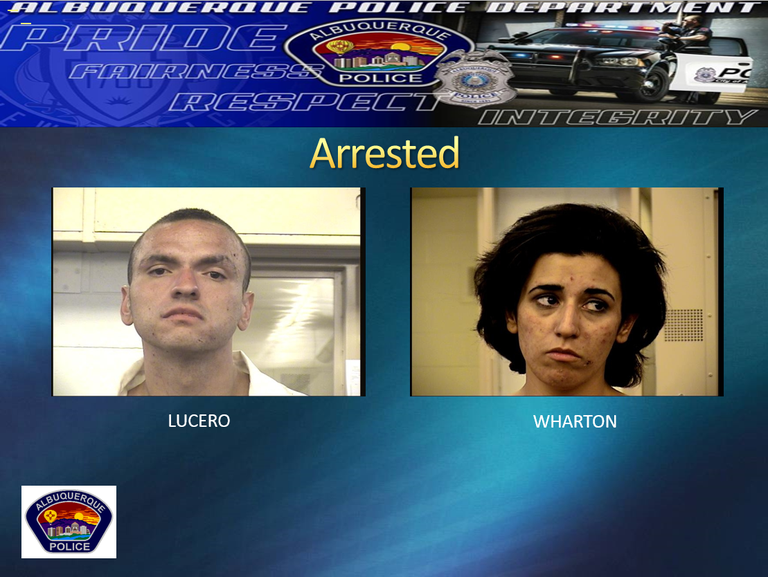 Metro Air Support assisted and followed Lucero as he drove reckless around Albuquerque while detectives kept at a distance. Lucero then drove out of Albuquerque on I-25 to Los Lunas where Los Lunas Police attempted a traffic stop of the vehicle. 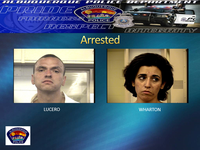 Lucero did not stop and fled from Los Lunas Police, continuing to drive extremely reckless. Lucero got back onto I-25 and went north back towards Albuquerque. Metro Air Support was able to maintain watching the vehicle as Lucero drove back into the Albuquerque city limits and into the Cinnamon Tree Apartments. Metro Air Support observed Lucero exit the vehicle and run on foot from the vehicle wearing blue shorts and a white T-shirt along with a female running from the vehicle wearing blue jeans and a purple shirt. Officers quickly arrived and set up a perimeter around the complex. Officers were told from residents that a male matching the clothing description as Lucero was seen exiting a vacant apartment now wearing a robe and was attempting to get into several other apartments. Officers located him and took Lucero into custody without incident. Officers were able to identify him as the driver due to he was wearing blue shorts and a white T-shirt under the robe. Officers located the female in the same vacant apartment and identified her as Megan Wharton. Officers discovered the vehicle belonged to Wharton and the city owned property was located inside her vehicle. Thank you to BCSO Metro Air Support for their assistance in apprehending Lucero and Wharton.